We spend a lot of time thinking about futurism, but the past is pretty interesting, too. In this week's "Ask a Physicist" we get extra speculative and think about what things may have been like before the beginning of time. What was there before the Big Bang? Did anything exist before our current universe? Here's what we know. For the most part, I try to keep these columns as by-the-numbers as possible. I generally want to focus on the consensus view of physics, and only like to veer off into the realm of crackpot science and speculation every so often. 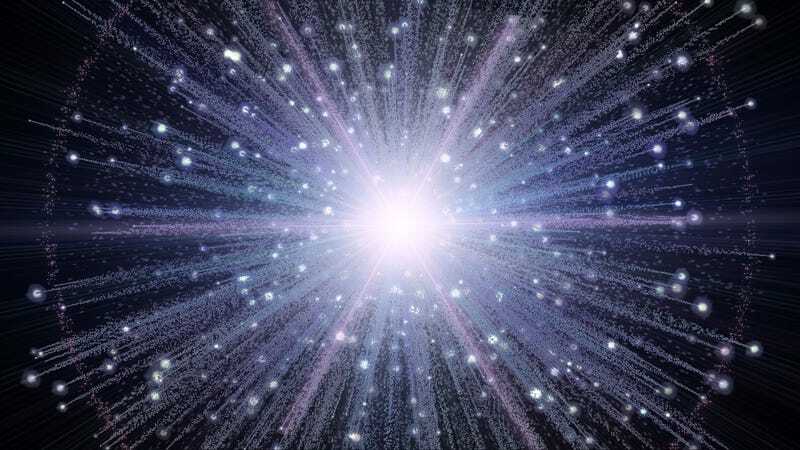 What was there before the big bang? I appreciate that there are no facts concerning what existed prior (if anything) but are there popular theories? Standard Answer: Nothing. So please don't ask. I've talked a lot about the expanding universe in this column. The standard picture comes from general relativity, which describes a sort of stretching of space-time. The normal analogy is to think of us as ants on a balloon. In the past, the universe (aka "the balloon") was smaller than it is now, and, taken far enough back, the universe, presumably, was a single point. That was the moment of the big bang. If The Universe Is Expanding, What&apos;s It Expanding Into? How can we measure the size of the universe? In the normal general relativity picture of things, the moment of creation produced not only space, but time; the two are incredibly intermixed, after all. To Einstein, talking about what happened before the Big Bang is just as nonsensical as asking what happens if you travel north of the North Pole. There just isn't just a place, or consequently such a time. This is likely to make people squeamish. After all, if there was no time before the Big Bang (or no space, for that matter) where did we come from? Shouldn't there be something resembling causality in the universe? We have some wiggle room, however. As I've discussed previously (and far less speculatively) not only don't we know what happened before the Big Bang, we don't even know what happened in the instant immediately following the Big Bang. The universe had some sort of beginning, in which case we're left with the very unsettling problem of what caused the universe in the first place. The universe has been around forever, in which case there's literally an infinite amount of history, both before and after us. Neither of these is satisfying. Take the Old Testament view, for instance. We're to understand that God created the world. In that case our universe has a definite beginning. However, God himself is supposed to be eternal. What was he doing before he created our universe? It's no more satisfying to assert that the universe has been here all along. Is there literally an infinite amount of history? That doesn't make sense. As a particularly clever cheat (or theory, if you prefer), in 1982 Alex Vilenkin of Tufts University showed how what we've learned from quantum mechanics might shed light on the how the universe popped into being. Vilenkin noted that if we were to somehow start with a small bubble of a universe, two things could happen. If it were large enough, it would undergo exponential growth — just like our universe did in the first instants. If it were small, it would collapse. Here's where things get weird. Quantum mechanics predicts all sorts of strange things, including half-dead/half-alive cats, or the possibility of teleportation. It also predicts the possibility that apparently impossible things are really just improbable. Image by CottonIJoe/Flickr. For instance, it's possible (but brain-bendingly unlikely) that you could spontaneously find yourself teleported to Alpha Centauri (readers: please insert obligatory Hitchiker's reference here). More commonly radioactive decay can be thought of as a small piece of an atomic nucleus that shouldn't really be able to escape from the rest somehow randomly tunneling away. The universe is just like that sometimes. In the same way, a small universe can randomly tunnel into a larger one. The amazing thing about Vilenkin's model is that even if you make the "little" universe as small as you like, this tunneling still can occur. It even works if the little universe has no size at all. You know what we call something with no size? Prior to the Big Bang, the state of the universe was something that possessed (no fooling) zero size and for which time was essentially undefined. The universe then tunneled out of nothing into the expanding universe we know and love. The problem is that the "nothing" that the universe popped out of wasn't really nothing. It had to know about quantum mechanics somehow, and we've always been taught to think that the physics is a property of the universe. It's troubling to think that the physics existed before the universe did, or, for that matter, before time did. Of course, this is the basic problem with any definite origin for the universe. Somehow all of the complexity had to be created from nothing, and it's difficult to reconcile that. The other possibility seems equally troubling. The universe might literally be eternal — or at least have an infinite history. While it's not clear what the theological implications of an infinite universe, we can at least try to figure out how an infinite universe might work. In 1998, J. Richard Gott and Li Xin Li, both then at Princeton, proposed a model in which the universe arose from what can only be described as a time machine. Gott and Li showed that it was possible to solve Einstein's equations of general relativity in such a way that a universe started off going around and around in a continuous loop, and that that loop could serve as the "trunk" of a tree that sprouted, giving rise to our own universe. Since a picture says a thousand words, let's illustrate with their own figure. The way to read this image is that for the most part, time travels from bottom to top, and that everything begins with the little loop at the bottom. That is the origin of the universe. This means that the universe has no beginning, since the loop goes around and around infinitely. We can talk about the "time after the Big Bang" as the time after the loop sprouted off into the future and a universe was born. You'll also notice that there isn't just a single horn coming out of the initial time loop, but many. This is totally consistent with the concept of a multiverse, just to add another level of speculative awesomeness to the discussion. For a long time, cosmologists played around with the idea that the universe might ultimately collapse on itself. Then, in 1998, two teams discovered that the universe was accelerating, essentially demonstrating that we were way off base. You may also recall that these folks won the Nobel prize this year for their discovery. Even though on the surface it doesn't look as though our universe will ultimately collapse under its own weight, there is still a great deal of allure to this picture. If the universe were somehow to end in a big crunch, then maybe what's really happening is that we'll eternally undergo a series of expansions and contractions, on and on for infinity. Our universe, in this case, is just one in an infinite series. The problem with this (besides the fact that there is too little stuff in our universe to make it collapse again) is one of disorder. As we've discussed previously, the universe loves disorder. If you've ever stacked soda cans, there's only one way to stack them, and that's straight up. But if you knock them over, they go everywhere. There are more ways to destroy a soda can tower then there are to build one, and as time goes on, the universe finds ways of destroying all other forms of order, too. Does entropy increase with time or does it make time? If our universe was the result of a series of expansions and collapses, then our Big Bang occurred billions or trillions of years after some beginning (and what caused that? ), so it would have had a very long time to get disordered. But it isn't. Looking back, our universe was very smooth, and in a very high state of order. This wouldn't solve the problem at all. But in recent years, there have been a number of new cyclic models that allow an eternal universe to exist. In 2002, Paul Steinhardt, of Princeton University, and Neil Turok, of Cambridge, devised a model that exploits the extra dimensions found in string theory. String theory supposes that our universe might not be three-dimensional at all, but might have as many as ten spatial dimensions. Our own universe might simply live on a three-dimensional membrane (or "brane" for short) that is floating through the universe, barely interacting with the other universes. However, the different branes (universes) could interact gravitationally. In this model, the dark energy that accelerates the universe isn't a real thing at all, but just a remnant of the gravitational attraction between branes, and the dark matter is just ordinary matter on the other, nearby brane. Occasionally the branes collide with one another, which would set off "Big Bangs" within the different branes and then everything would proceed as we've already seen. These models are extremely elegant and deal with the whole "increase of disorder" problem in a really novel way. In cycle after cycle, the branes get more and more stretchy, which means that the disorder gets spread out over a larger and larger volume. The local patch that we call our universe, however, is just a small patch of the brane, so we seem to start nearly from scratch at each go-round. It sounds great, but a big problem is that these models require string theory to be correct, and on that the jury is definitely still out. And there are even more models, some including extra dimensions, some include concepts like "loop quantum gravity," some infinite in time, and some with a definite duration. At the end of the day, the Big Bang theory has the same basic problem as evolutionary theory. Both do a nearly perfect job in explaining how the universe (or life) changed when it first came about, but neither can explain how things really got started in the first place. This column was adapted from parts of Chapter 7 of A User's Guide to the Universe. Dave Goldberg is the author, with Jeff Blomquist, of "A User's Guide to the Universe." (follow us on twitter, facebook, twitter or our blog.) He is an Associate Professor of Physics at Drexel University and is currently working on "The Universe in the Rearview Mirror," a new book all about symmetry that will be published by Dutton in 2013. Please send email to askaphysicist@io9.com with any questions about the universe.